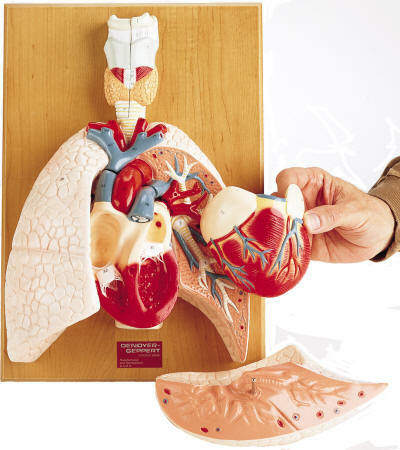 Fully three-dimensional and mounted on a hardwood base, the life-size unbreakable plastic anatomical model of the cardiopulmonary system includes lungs, trachea, heart, esophagus and complete larynx with vocal cords, all in the natural position. The right half of the larynx can be removed as well as the heart and half of the left lung which exposes the bifurcation off the trachea and bronchial tree, the pulmonary arteries and pulmonary veins. The heart itself splits in halves to shows its four chambers and valves, thus providing understanding of the directional blood flow there. Pulmonary circulation can also be easily traced and with major vessels of the systematic circulation depicted, blood flow through the entire body can be demonstrated. 58 numbered structures are identified in the corresponding key. Overall dimensions are 17 x 11 x 6 inches. NOTE: This is hand-made model, custom made to order. Please allow 4 weeks for delivery.